“Crown Me” is the work of local artist Damon Reed and some very artistic Alain Locke elementary school students. The project was made possible by the Chicago Public Art Group and funded by a grant from Ingenuity and Chicago Public Schools’s Creative Schools Fund. The piece, which is located in the main stairwell between Alain Locke’s first and second floors, features hand-painted tiles and is inspired by the wisdom passed down from generation to generation. Reed has made a living in Chicago as a muralist, illustrator, painter and graphic designer since graduating from the School of the Art Institute in 1996. His works have been sponsored by organizations including LISC Chicago, Allstate and Children’s Memorial Hospital. 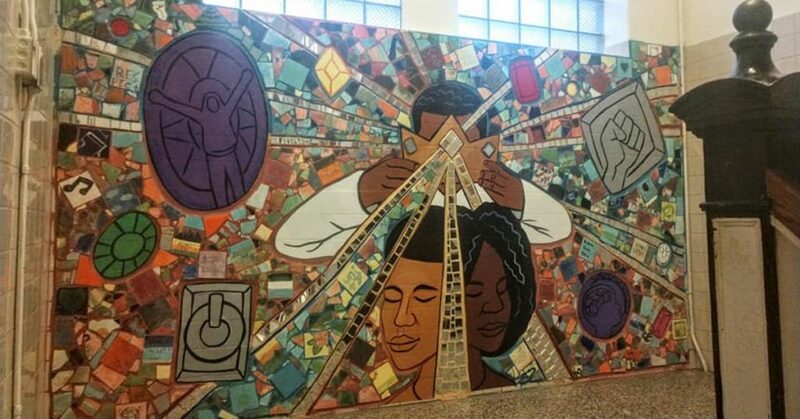 Big thanks to Damon Reed, the Chicago Public Art Group, Ingenuity and, of course, our very talented students for making the beautiful “Crown Me” a reality for Alain Locke.